The two men we meet at the floe edge have just chased off a polar bear. A giant paw reached out of the water and pulled its shaggy yellow body up onto the ice, not 10 metres in front of them. They yelled and the beast returned to the water. The men hardly seem shaken, sitting back in folding chairs. They are here to hunt narwhal, but right now only seabirds ride the waves of Baffin Bay. Niko Inuarak frequently surveys the terrain around us, like a driver checking his blind spots. I trust his eye and his gun. Back in town I was told that being at the floe edge is like walking around New York City: you always have to be alert. I’ve never been nervous about thieves looming down dark city streets, but here my eyes follow polar bear tracks that crisscross the snow-covered ice. We’re at the mouth of Eclipse Sound, the channel between northeastern Baffin Island and Bylot Island above it, about two hours east by snowmobile from Pond Inlet, Nunavut. We travel south along the edge of the ice towards the mountains of Baffin Island that rise up in perfect triangles. Bright white glaciers between the mountains reflect the sun’s rays and they’re blinding. The only clouds in the sky today are a dark grey puddle above Baffin Bay. That’s how you know where to find the floe edge, Inuarak says. The clouds always form over the open water. He was born and raised in Pond Inlet and comes from a family of hunters and guides. Inuit have been hunting narwhal here for some 2,000 years, developing techniques to capitalize on the whale’s migration south from an area called the North Water Polynya through the sounds, fiords and inlets of the Arctic archipelago. This time of year, in mid-June, the floe edge is the “Serengeti of the Arctic,” says Inuarak. We stop talking. It’s quiet enough to hear the narwhal blow out air as they arc up to the surface of the water, five metres from the floe edge. A narwhal is a prized catch for its bounty of maqtaaq and for its ivory tusk—a tooth that juts out from the front left side of its head, which can be sold for thousands of dollars. We wait to hear a gunshot. This natural phenomenon, the North Water Polynya, is the largest of its kind in the Northern Hemisphere. Warm Atlantic currents move up the west coast of Greenland and meet the cool Arctic current running south, down the shores of Ellesmere and Baffin islands. This discourages ice formation. The northern edge of the polynya is marked by a barrier of ice that runs across Kane Basin, from Ellesmere Island to Greenland, and prevents the polar pack ice from moving south to crowd the open waters of the polynya. As the sun returns to the sky after its months-long absence over the high Arctic in late February and the hours of daylight incrementally increase, photosynthesizing organisms gain energy in the polynya’s open waters. 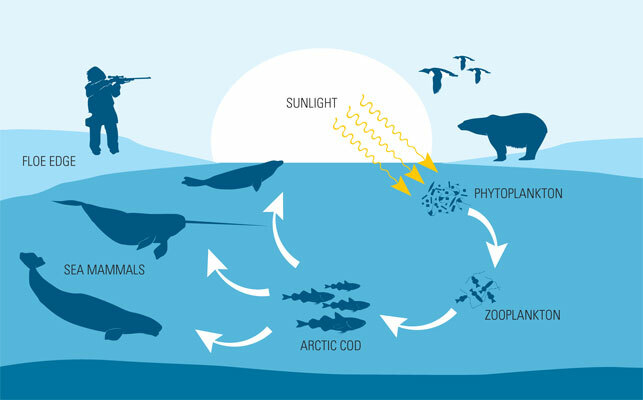 An early bloom of phytoplankton feeds the zooplankton that sustains the polynya’s keystone species, Arctic cod. Whales and humans rely on that cod, while molluscs and other organisms feed seals, walrus and other mammals at the polynya’s edge until spring break-up. In July, the rest of Baffin Bay is thawing and the animals migrate to their summering grounds throughout the Arctic archipelago. Over summer, the polynya is indiscernible from the water around it until October, when the barrier—the arch of ice—forms again. The North Water Polynya remains a bit of an El Dorado for Chris Debicki, Nunavut projects director with Oceans North—an organization under Pew Charitable Trusts that promotes conservation based on science and Indigenous knowledge. 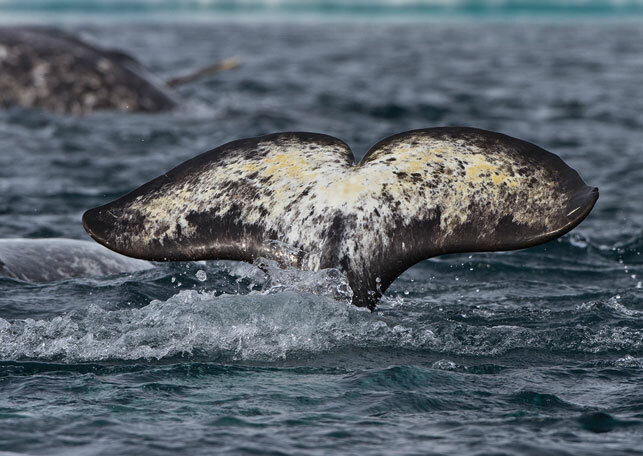 In 2011, he and a team of researchers headed out in June on a converted crab trawler to study the early spring plankton bloom in the polynya and to follow the narwhal migration into Lancaster Sound. Their 45-foot vessel, the first of its size to attempt the trip that early in the season, was stopped by sea ice. The polynya’s is a climate change paradox that runs counter to the more common narrative. The problem as we know it is as follows: the polar ice cap is melting and the exposed water absorbs the sun’s energy rather than reflecting it, resulting in a rapidly warming Arctic. But the polynya is shaped by that very distinct arch of ice to the north. If it doesn’t form because of increasingly stormy or warmer weather, that means there’s more ice in the polynya. And more ice means less sunlight gets absorbed, which inhibits the photosynthesis that makes the polynya teem with life. “You don’t have that early bloom, so you have less productivity in those years,” says Debicki. Hunters from the northern edge of the polynya, in the Qaanaaq region of Greenland, spoke to Debicki about the relationship between ice-cover and life—specifically, how years with more ice cover resulted in fewer animals in the water. For harvesters in Qaanaaq, another immediate concern was the challenge they had navigating the ice-filled waters of the polynya, says Debicki. And buying meat isn’t a much better option. Shelves of frozen chicken, beef and pork are up to three times more expensive in Pond Inlet than down south. And this time of year, grocery stores are starting to run bare. (I don’t have much to compare it to, but a woman eyeing the same box of crackers as me is quick to complain.) The next sealift will come in late July when Eclipse Sound breaks up. Aside from food caught on the land or water, everything has to be shipped or flown in. People are in and out of Pond Inlet this time of year. There are seals and narwhal at the floe edge; it’s goose egg season just across the sound. Mayor Joshua Katsak is having a coffee break in the lobby of the hamlet office with a few others when I stop by. He’s hesitant to talk, which isn’t unexpected. 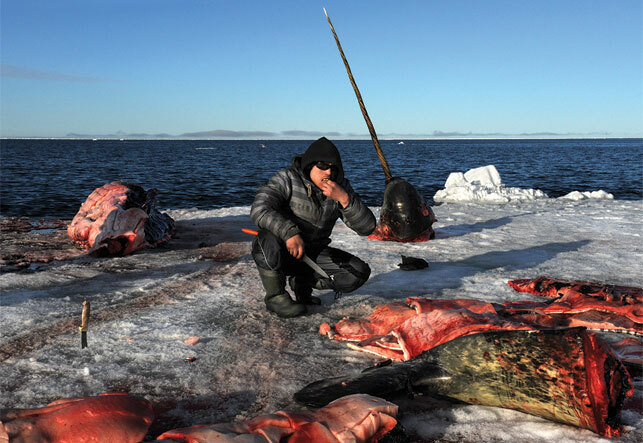 The narwhal hunt has been broadly portrayed as wasteful and inhumane, despite its role in sustaining communities like Pond Inlet. Eventually, Katsak tells me he sees fewer narwhal these days, especially close to town. They used to swim right up to the town’s shore, he says. He got his first narwhal when he was 13. At the floe edge, the men in the folding chairs who wait for their shot have similar stories. And they have many years on the land and water to tell of the ways its changed. Right now, the North Water Polynya is without special protection. It covers the territorial waters and exclusive economic zones of both Canada and Denmark (Greenland). Establishing any sort of management plan requires the involvement of both governments. But before either country, or the world, define what the North Water Polynya is, the Inuit who rely on it to live are making that determination. In 2016, an Inuit Circumpolar Commission delegation, including researchers like Debicki, visited Inuit communities on both sides of Baffin Bay to report back on how to manage the North Water Polynya—“the Great Upwelling” or Pikialasorsuaq in Greenlandic. They met with regular citizens and members of the Hunters and Trappers Organizations who are most attuned to the land and waters. The commission asked how the polynya was used; what has changed; how Inuit hope to see it protected; and how they wanted to be a part of that process. The amazing thing, says Canadian ICC commissioner and former Nunavut premier Eva Aariak, was to hear the same response on both sides of the water: the polynya is critical to the livelihood of people around it, and they want to ensure it is not lost. The vision that came out of the meetings—and recommended in the forthcoming report—is a defined geographic area spanning the polynya that, led by Inuit, would be managed and monitored, to set future rules for tourism, shipping, oil and gas exploration and commercial fishing activities. Community-based monitoring will be key to marking any impacts these growing industries have on this critical environment. The next step, Aariak says, is putting these recommendations into action—and getting all levels of governments on board. It might need to happen sooner than later, as more change is coming to these Arctic waters. Farther south, seismic lines for oil and gas exploration are scratched across Baffin Bay, Lancaster Sound and various pockets of the Canadian Arctic Archipelago. The Canada-U.S. five-year moratorium on oil and gas exploration in the Arctic precludes any such activity for now, but when it expires—and if oil prices recover—there could be a new rush of interest. International governments and shipping companies have their eye on the Northwest Passage which starts at Lancaster Sound, at the southwest edge of the North Water Polynya. The polynya was historically used by European whalers seeking bowhead in the springtime when other routes to the passage’s entrance were still frozen. “They want this to be an international strait,” Niko Inuarak tells me, pointing north across from the floe edge, to where the only discernible mark on the horizon is more pack ice. Greenland is more than 600 kilometres away. China has prioritized the Arctic Ocean as one of its three “blue economic passages” in a plan to better connect Asia with the rest of the world and this summer sent its first icebreaker through the passage. The United States already considers the route international waters. A voyage through the Northwest Passage can shave off two weeks of travel between Japan and England compared to using the Panama Canal. Consider that shipments cost hundreds of thousands of dollars a day in fuel, equipment and staff. Though not yet a major transportation route for global commerce, it is the primary migration route for narwhal. Scientists estimate 75 percent of the world’s population move through Lancaster Sound. Other marine mammals in the Canadian Arctic move through it too. And they have for millennia. Travelling with the commission, she heard stories of more volatile seas, a shed in Grise Fiord washed away by the rising water and eroding shoreline, new species of fish caught throughout the Arctic and narwhal that are shorter and fatter than usual. Change is a constant in the Arctic, Aariak says, but not everything like this. Not everything all at once. We follow the floe edge north toward Bylot Island and come across a qamutiq like ours—plywood walls with cut-out windows covered in plastic and a canvas roof. Inuarak’s brother, Lee, and his hunting partner are butchering a narwhal. Minutes ago, they tell us, the waters were spiked with tusks. The narwhal’s massive head, with its signature seven-foot tusk, is sitting beside the body—the flesh and back muscles have already been carved off. They will harvest the maqtaaq and make drymeat from the whale. We squat down and Niko Inuarak cuts off small pieces of maqtaaq to eat. 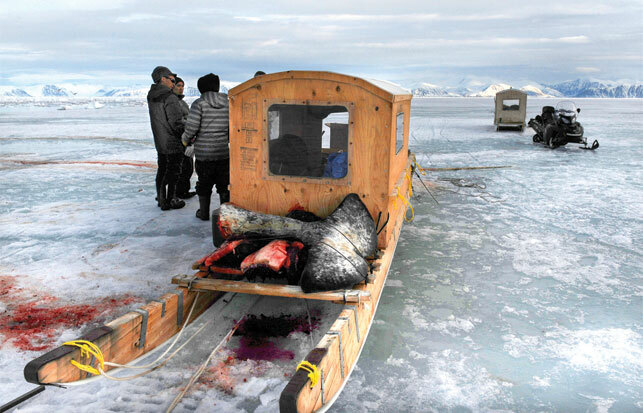 The men use gaffs—mostly sawed off hockey sticks with sharp hooks attached at the end—to drag the narwhal meat back to Lee’s qamutiq. After they’ve dislodged the tooth, two of the men grab hold of the tusk, turning clockwise slowly while Lee holds the bulbous end of the nerve that runs up the entire length, turning it over in his hands to counter their movement. Everyone knows what to do without being told. With a sucking sound the nerve releases and slips out of the bottom of the hollowed tooth. With some cleaning, it will be ready to sell. As we travel back, west across Eclipse Sound, the plywood walls quiver and shift as we glide over cracks in the ice, two feet wide and bright blue. Scattered across the ice are seal holes—some with blubbery forms lounging beside, some with dark grey heads that bob up and down until we get too close and they stay down. My companions want to get one, but it’s not a good time for adult seals. In the spring, the fur falls off the adult skin, making it less desirable for use as clothing, like sealskin mittens. I borrowed a pair for the trip. Even with the temperature just above zero and the sun continuously overhead, warmth is hard to come by in the Arctic. Two of us in the qamutiq are bundled under sleeping bags as we pass a pair of hunters heading out to the edge. It’s 3 a.m. They’ll likely stay out all morning and return to town in the afternoon to sleep. There’s little reason to abide by a nine-to-five schedule here. 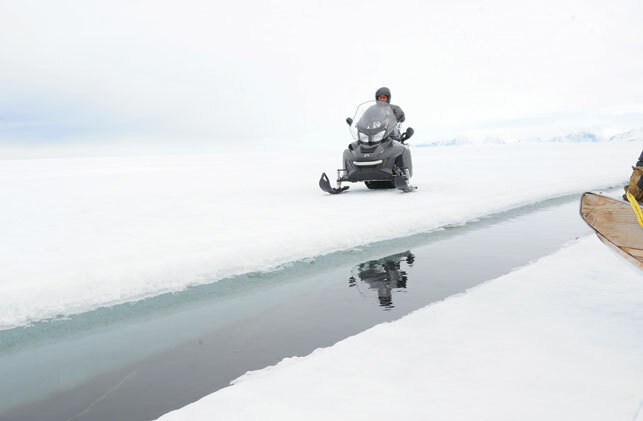 Just between the hulking triangular form of Mount Herodier and the small homes of Pond Inlet, the sled comes to a stop. “They dropped their dog food,” Inuarak says, and runs back on our trail to pick up a slab of narwhal meat that’s fallen off of Lee’s qamutiq. The muscle that lines the back is black and stringy. Some people eat it; most feed it to their dogs. Snowmobiles and qamutiqs are clustered along the shore and the roar of engines echoes through the sound. It’s 4 a.m. now. Children are outside playing on the steep shore that rises out of the water into dusty roads. Snowmobiles buzz past at all hours of the night. Pond Inlet does remind me of New York City in a way—in the summer, at least, it never sleeps. For the two hunters we passed, just now arriving at the floe edge, it will be a waiting game until the tide takes away the pack ice that's collected. Unstable blocks will have piled seven-feet high, the crisp edge a cluster of mounds and pools. Soon enough that ice will go out completely. In the next month, sealifts will replenish the grocery stores and hunters will travel west on Eclipse Sound by boat. The water is too rough to the east. This is a place of adaptation, of thriving on shock and disorder, Niko says. “The land teaches that to the people.” And so it will continue. This story was made possible by a generous grant from the Society of Environmental Journalists. There was a technical error in the printing of the September issue that affected this feature. A PDF of the original story is available here.